Speak Life! You have to be intentional about speaking life. Just because you are not speaking death does not you are speaking life. You have to open your mouth and speak. You have to speak…TRUTH to POWER It is necessary for you to call out your purpose. The Bible says to call those things that are not as though they were. It is important to not only envision that which you require, but to openly state your intentions. I’m an author so it isn’t “one day I hope to write a bestseller.” It is, “One day I WILL publish a bestseller.” What statement do you need to change? When you speak life using the Word of the Lord, you are not speaking from your authority. You are speaking directly from the authority of God. His Word travels through you, unto the world. You are merely the messenger, He is the author. Tasha Cobbs Leonard has a song called “This Is A Move”. She says mountains are still being moved; giants are still being slayed. Ultimately the song is about miracles. Do you still believe in miracles? Then speak your truth and live it. For me being a bestselling author is not about fame but to spread message of encouragement to others; motivate others; help people and causes financially so I living that truth now with God has given me. When you are faithful over a few things, watch God work. There is power in your words just like it was power in the words of those before us. February is Black History month. Throughout the month we lifted up African American History and how those before us not only spoke life but sacrificed their lives so we had the right to speak and live life freely. Don’t stop! Keep speaking not just about the past but right now in the present; speak about what is needed in the present so the generations behind us will have a better future. New history is being written every day. I was walking through the break room one day and there was an interview on MSNBC with Cynthia Marshall, CEO of the Dallas Mavericks, the first African American female CEO of an NBA team. Because people were speaking out, she was called in to make a difference and bring a change in a front office culture overrun with rampant sexual harassment and reports of domestic abuse. They call her a courtside trailblazer…I call her a trailblazer period…read her story. New history is being written every day and if we want it to continue we must pour into our future. When you remember and trust the God of our past, despite how the present looks, it gives us great hope for the future. It gives us great hope for who we are becoming. We become more by speaking life into the future generations and encouraging them to speak life. When Jeremiah cried that he was too young God said, “Do not say ‘I am too young’. Go to everyone I send you to and SAY whatever I command you. Don’t be afraid, for I am with you”. Support the future history makers as they speak life. Though uncertain, surely there is future. Speak life through the uncertainty caused by unemployment. The financial rule of thumb is to have enough money saved to cover 3-6 months of expenses in the event of a job loss, but truth be told most of us are living paycheck to paycheck with very little saved for an unexpected emergency, let alone 6 months of living expenses. Whether impacted by the government shutdown or company buyouts, reorgs and downsizings, most people faced with a change in employment status face uncertainty. Life changing events, whether positive – like getting married or having a child or negative – like an unexpected health diagnosis – bring uncertainty. What do you do when you are faced with uncertainty? Speak life. The Word of God is living, breathing. Say, I will “be anxious for nothing but in everything with prayer and supplication, with thanksgiving, make my requests made known to God”. Say, “The peace of God which surpasses all understanding, will guard my heart and mind through Christ Jesus”. Peace is a beautiful thing. So what are you to do when you are uncertain so you can experience the peace that surpasses all understanding? 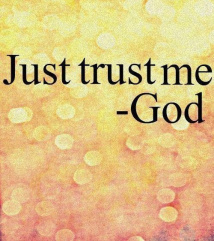 Trust God! Speak life! Remember God did it before and he will do it again. Change is constant; it is a fact of life. You cannot predict it but as you trust God you can roll with it. If you are facing a season of uncertainty, don’t give up. Reflect back on past seasons and remember how God kept you and how he brought you out. If God did it before, he will absolutely, positively do it again. I may not know what the future holds for me but I absolutely without a shadow of a doubt know the One who holds the future and I trust that my Father has it ALL including me in his hands. Speak life over yourself and into the lives of others as you hold God’s unchanging hands in your season of uncertainty.